With fall in the air, everyone’s mind may be on hayrides, pumpkin spiced lattes, and hanging door wreaths. In between all the fun, it is important to do a little fall cleaning to prepare your home for winter. 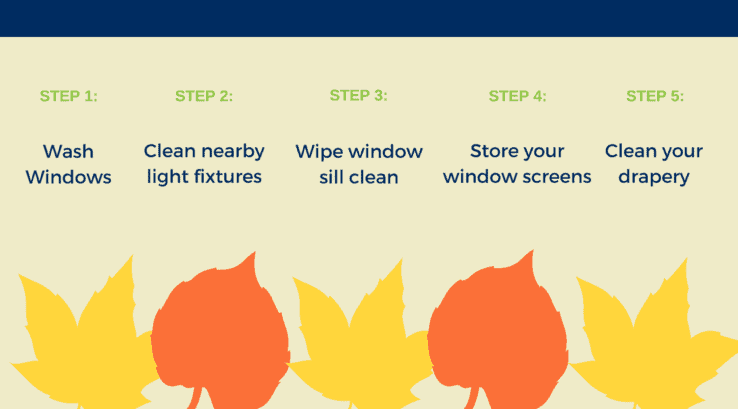 These 5 simple steps will protect and clean your windows. With any luck, you’ll breeze through these chores and get back to enjoying the October (and November) sky. Clean any nearby light fixtures. Unless you like authentic Halloween decorations, be sure to clear the cobwebs from light fixtures. You can use the same glass solution you used on your windows. Wipe the window sills clean. Use a vacuum to lift out debris from the sill and to clear the interior space of the window. Sometimes vacuuming the screens is helpful, too. When you’ve finished vacuuming, wipe the window sills clean with a damp cloth and more of the solution you used to clean your windows. Clean the drapery. Many people like to dust drapery at the change of seasons. Others take it all down to wash it thoroughly once a year. By following these simple steps, your home will not only be clean, but also prepared for whatever weather the winter brings. Thanks for pointing out that the tracks must be thoroughly cleaned so that there will be no incidents of stuck windows in the future. I will keep this in mind so that we will not have such issues. I just needed to know about these things because we will have all the windows replaced next month in the house that we’ve bought. It is because they are too old already. All of the winter window preparation tips are important to ensure your windows will perform their best during the cold months. Check back for more tips soon! Great advice! I would add “don’t hire a handyman”. I have seen more problems created by a “handyman” that turned a simple repair into an expensive replacement. We are extremely proud to be the one company that does it all – design, build and install. All of our products are backed by our warranty and post-installation service so our customers don’t have to worry about a handyman ever again! I would loke to say that һis write-up very forced me to take a loik at and do so! Your writing style has been sսrprised me. Thanks, veгy nice article. We’re glad we could help you with your questions. We appreciate you comment! I have new double hung windows & screens. How do I remove the screens without doing damage ? Do you have Thompson Creek Flex Screens? Thank you for your comment, Christopher. Yes, this is something covered under the lifetime warranty. Please contact us at (301) 640-5497. We look forward to resolving this issue. My Thompson creek windows are very cold to the touch ? Is this “normal “? Hi Nina! Yes, this is very normal. Instead of allowing the cold air into your home, Thompson Creek windows will attract the cold air, making the windows cold to touch. I had no idea that ice could damage your window panes. It is important to consider maintenance when choosing windows. We are planning on getting new folding windows, so I wanted to look into it beforehand. I agree that your home’s exterior envelop takes all the beating during rains and hot temperature as well as absorb all kind of dirt and molds. It’s a great thing that you mentioned proper ways on how to clean the vinyl siding. This is informative to me because I’m planning to get vinyl siding for my new house. Once done, I’ll remember all these tips to make sure that the coating is always sturdy from any external factors.